1. I have the best boyfriend in the world. We met when we were six and we have been together since we were fourteen going on fifteen. It is our seventh anniversary at the end of this year. Andy and me at 17. Highschool sweethearts! 2. I love reality tv. Masterchef, So You Think You Can Dance, Project Runway, Top Chef, Real Housewives of NYC... you name it. My favourite at the moment is Work of Art. It's amazing. Work of Art... The host, China Chow, is divine. 3. I don't wear jeans. Ever. 4. 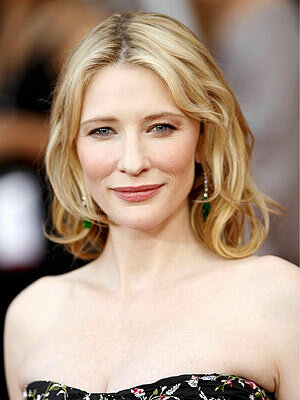 I adore Cate Blanchett. A couple of years ago, I saw her in a Shakespeare play for her theatre company. I was in the front row and she was amount two meters away from me. She is just as beautiful and talented in person as she is onscreen. 5. I don't like Evian Water because it tastes too clean. 6. I have a gorgeous little Poodle/Maltese called Janet. I named her after an Enid Blyton character (I was nine at the time). She is 12-years-old but everybody still mistakes her for a puppy. 7. I own a Wii Fit which I played once. 8. I own a copious amount of cosmetics. I have so many products that I have banned myself from buying any more makeup and skincare. I collect nail polishes instead now. Chanel Vendetta and Nouvelle Vague are my favourites so far. This was taken a while ago... the collection has grown a lot since then! 10. When I like a song I put in on repeat for a day or so until I get sick of it and never want to hear it again. Samson by Regina Spektor is doomed. Thank you! Except no, he's not in your year one class, he's in mine! I was going to most the photo but I thought I would be violating our other classmates' privacy rights. It's very cute. Oh, it must have been another year! We were all very cute though! I guess if you wanted to post it you'd have to fuzz out everyone else's faces, but I don't have a clue how to do that - too much effort!